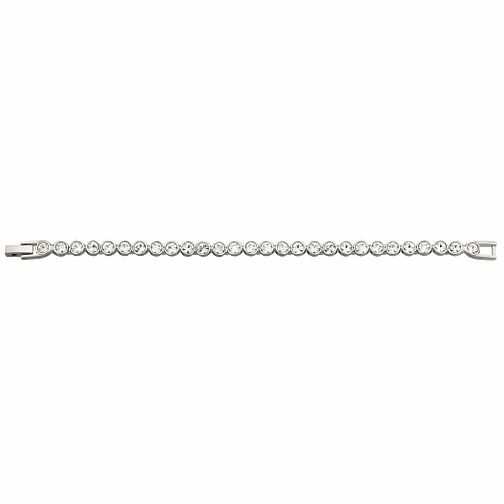 A delicate rhodium-plated tennis bracelet, bezel set with delicate Swarovski crystals. This bracelet comes with an extender link to allow the desired fit. A stunning addition to complete your look, perfect for those special occasions. Swarovski tennis bracelet is rated 5.0 out of 5 by 8. Rated 5 out of 5 by Anonymous from I always buy from Ernest Jones If we need to buy jewellery we always go to Ernest Jones first and find there is no need to go anywhere else. We bought our wedding jewellery from here and various other pieces. Even if we don't 'need' anything, I can't pass by without having a look. Great choice, excellent value and customer service has always been great too.